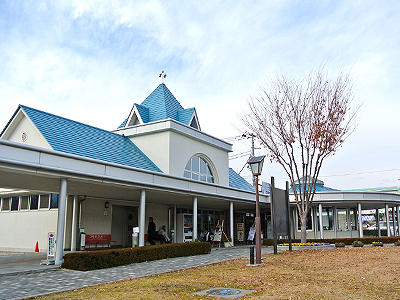 Information and eat-in building of Michi-no-Eki ‘Shirane’. If you are willing to go directly to this area, take Chubu-Odan EXPWY at FUTABA JCT of Chuo Expressway (right after ‘Kofu-Showa’) and get off at the ‘Shirane’ exit (the first IC). Chubu-Odan EXPWYW is quite a new expressway, still under construction. It will be completed in 2017, connecting Shizuoka Pref. and Nagano Pref. passing through Minobu area and Minami Alps area. 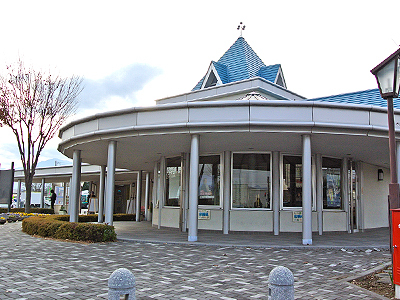 From the ‘Shirane’ exit, Michi-no-Eki ‘Shirane’ is only 800 meters away, on Yamanashi Prefectural Road 39. If you are coming from Michi-noEki ‘Toyotomi’ which would only take you about 30 minutes, take Yamanashi Prefectural Road 29, heading north, then turn right at ‘Tamaho Chou Ramp’ onto Yamanashi Prefectural Road 12. Keep the road about 7 km. 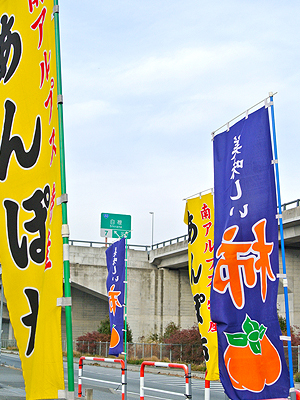 You will find a green road sign of Chubu Odan Expressway. Turn right at Minami Alps I.C. and go on the Expressway. You won’t be charged going on the Expressway to cross over the river! Get off at ‘Shirane’ exit. When we visited the place, we didn’t know that crossing over the river on the Expressway was free of charge so we tried many other roads to avoid the Expressway to save our money. Unfortunately, we couldn’t find other ways to cross the river without getting on the Expressway, gave up and took the Expressway preparing to pay for the ride. But the ride was free!! We should have gone on it earlier if we knew, so here’s the useful information for you to save your time. Get on it to cross the Kamanashi River at this point. The driving route to this Michi-no-Eki ‘Shirane’ has a lovely landscape, especially in Spring with cherry and peach blossoms at bloom with high Minami Alps mountain range at their back. Farmers’ seasonal crops market building across the street. 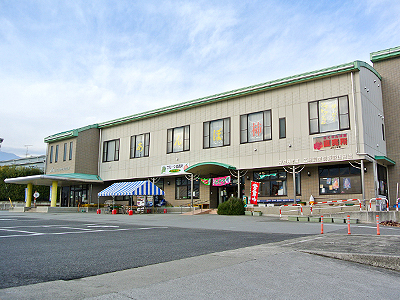 Unlike other Michi-no-Eki, Michi-no-Eki ‘Shirane’ consist of two buildings across the street. A buiding selling farmers’ seasonal crops which is a ‘MUST’ to visit, is across the street from Information Center. The area around the Michi-no-EKi, Minami-Alps area, is a paradise of fruits and you will find cherries, peaches, plums, kaki (persimmon), grapes, apples… depending on the season when you visit. If you happen to be in Japan in early summer and autumn, you should come over here to taste surprisingly delicious fresh fruits, especially peaches in June and kaki (persimmon) in November to December. 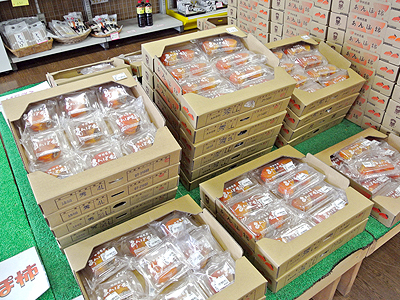 Dried kakis sold in carton boxes in great price! The dried kakis here are one of the best in Japan! 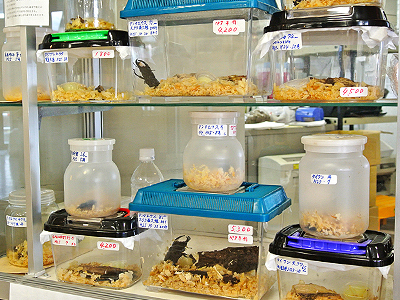 They also sell stag beetles and rhinoceros beetles captured in the forest nearby which are popular insects in Japan in Summer, especially for kids. 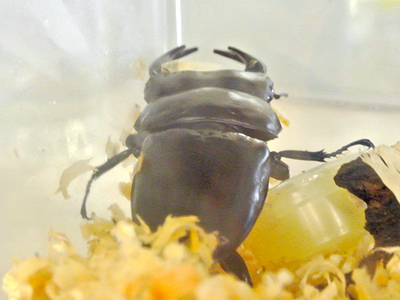 Rhinoceros beetels’ lives are 1 year but when we visitied here in December, we found some stag beetles fit, still sold! Some stag beetles can hibernate and live up to 2 to 3 years! Satg beetles for insect lovers!!!! Stag beetle in December, sold. He seemed very fit! They hibernate and live up to 3 years. Address : 595-1 Zaikezuka, Minami-Alps-shi, YAMANASHI Pref.